NBCSN television broadcasts: Qualifying, 1:30 p.m. ET Saturday, Aug. 18 (live); Race, 1:30 p.m. ET Sunday, Aug. 19 (live); Leigh Diffey is the lead announcer for the NBCSN broadcasts this weekend alongside analysts Townsend Bell and Paul Tracy. Pit reporters are Jon Beekhuis, Katie Hargitt, Kevin Lee and Robin Miller. Advance Auto Parts INDYCAR Radio Network broadcasts: Mark Jaynes is the chief announcer alongside analyst Anders Krohn. Jake Query and Nick Yeoman are the turn announcers with Dave Furst, Ryan Myrehn and Michael Young reporting from the pits. The Verizon IndyCar Series race is broadcast live on network affiliates, Sirius 98, XM 209, IndyCar.com, indycarradio.com and the INDYCAR Mobile app. The Verizon IndyCar Series qualifying session is broadcast live on Sirius 216, XM 209, IndyCar.com, indycarradio.com and the INDYCAR Mobile app. All Verizon IndyCar Series practice are available on IndyCar.com, indycarradio.com and the INDYCAR Mobile app. Video streaming: Both ABC Supply 500 practice sessions will stream live on RaceControl.IndyCar.com and on the INDYCAR YouTube channel (www.youtube.com/indycar). Scott Dixon leads the Verizon IndyCar Series championship with four races to go for the third time in his career. He also led the championship with four to go when he won the title in 2008 and in 2009 when he finished second to Dario Franchitti. Dixon has led the 2018 championship since his win at Texas on June 9. Scott Dixon leads Alexander Rossi by 46 points with defending series champion Josef Newgarden (-60) in third and Indianapolis 500 winner Will Power (-87) in fourth. There are 14 drivers still mathematically eligible for the 2018 Verizon IndyCar Series championship: Scott Dixon, Alexander Rossi, Josef Newgarden, Ryan Hunter-Reay, Will Power, Robert Wickens, Simon Pagenaud, Graham Rahal, James Hinchcliffe, Sebastien Bourdais, Marco Andretti, Takuma Sato, Ed Jones and Spencer Pigot. Any driver who trails the points leader by 213 points or more following the race will be eliminated from contention. Since the first Indy car race at Pocono in 1971, the winning driver has won the Indy car championship six times: Joe Leonard (1972), A.J. Foyt (1975 and 1979), Tom Sneva (1977), Rick Mears (1982) and Scott Dixon (2013). Key championship point statistic: The driver that has led the championship with four races to go has won the championship five times since 2008. Scott Dixon (2008), Dario Franchitti (2011), Ryan Hunter-Reay (2012), Simon Pagenaud (2016) and Josef Newgarden (2017) all won titles after holding the lead with four to go. Point differential: The 46 points which separate Scott Dixon and Alexander Rossi is the fifth-largest margin since 2008. Dario Franchitti (2010) and Dixon (2015) overcame leads of more than 50 points with four races to go. The average deficit with four races to go since 2008 is 35.7 points. Championship-eligible drivers results at Pocono: Will Power (2016 and 2017), Ryan Hunter-Reay (2015) and Scott Dixon (2013) have won previous races at Pocono…Power has won three of the last four 500-mile races, including back-to-back races (Pocono 2017 and Indianapolis 2018). Al Unser is the only driver to win three consecutive 500-mile races, all in 1978 (Indianapolis, Pocono, Ontario)…Josef Newgarden and Power have finished in the top five in four of their five starts at Pocono…Dixon, Newgarden and Power have finished in the top 10 in all five of their starts. There have been seven different winners in the 13 previous Verizon IndyCar Series races in 2018: Sebastien Bourdais (Streets of St. Petersburg), Josef Newgarden (ISM Raceway, Barber Motorsports Park and Road America), Alexander Rossi (Streets of Long Beach and Mid-Ohio Sports Car Course), Will Power (INDYCAR Grand Prix and Indianapolis 500), Scott Dixon (Raceway at Belle Isle-1, Texas Motor Speedway and Streets of Toronto), Ryan Hunter-Reay (Raceway at Belle Isle-2) and James Hinchcliffe (Iowa Speedway). Dixon’s win at Toronto on July 15 was his 44th career win, which ranks third on the all-time Indy car victory list. 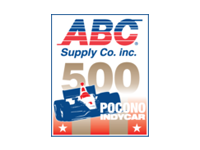 The ABC Supply 500 will be the 25th Indy car race at Pocono Raceway. Will Power won the race in 2017, the first Indy car driver to win back-to-back races at Pocono. Mark Donohue won the first Indy car race at Pocono in 1971. A.J. Foyt, who fields the cars of Matheus “Matt” Leist and Tony Kanaan, is the winningest driver at Pocono Raceway with four victories (1973, 1975, 1979 and 1981). Rick Mears won at Pocono three times, while Al Unser won at Pocono twice. Past winners Scott Dixon (2013), Ryan Hunter-Reay (2015) and Will Power (2016-2017) are entered this year. Five drivers have won the Pocono race from the pole – Mark Donohue (1971), A.J. Foyt (1979 and 1981), Bobby Unser (1980), Rick Mears (1982 and 1985) and Juan Pablo Montoya (2014). Team Penske has won 10 times at Pocono. Penske’s winning drivers are Mark Donohue (1971), Tom Sneva (1977), Bobby Unser (1980), Rick Mears (1982, 1985 and 1987), Danny Sullivan (1989), Juan Pablo Montoya (2014) and Will Power (2016 and 2017). Chip Ganassi Racing has one win at Pocono when it swept the podium in 2013 with Scott Dixon, Charlie Kimball and Dario Franchitti. Andretti Autosport, owned by Michael Andretti of nearby Nazareth, Pennsylvania, won at Pocono in 2015 with Ryan Hunter-Reay. At least 16 drivers entered in the event have competed in past Indy car races at Pocono. Marco Andretti, Ed Carpenter, Scott Dixon, Ryan Hunter-Reay, Tony Kanaan, Charlie Kimball, Josef Newgarden, Simon Pagenaud, Will Power, Graham Rahal and Takuma Sato each have five starts, most among the entered drivers. Thirteen entered drivers have led laps at the track (Power 175, Kanaan 147, Andretti 97, Dixon 92, Newgarden 73, Hunter-Reay 72, Alexander Rossi 48, Pagenaud 31, Rahal 9, Kimball 5, Sebastien Bourdais 4, James Hinchcliffe 3 and Sato 3). Kanaan and Power have led in each of their five previous starts. Four rookies – Pietro Fittipaldi, Matheus Leist, Zach Veach and Robert Wickens – are expected to compete. None of the rookies nor veteran driver Spencer Pigot has made an Indy car start at Pocono Raceway. Tony Kanaan seeks to start his 297th consecutive race this weekend, which would extend his Indy car record streak that began in June 2001 at Portland. Scott Dixon has made 237 consecutive starts heading into the weekend, which is the second-longest streak in Indy car racing. Marco Andretti has made 213 consecutive starts, which is the third-longest streak in Indy car racing.